The motivation for the following genealogy research came about in year 1948. The reason for my motivation were the many stories of my grandmother about her homeland. Even today after 54 years I can still see the enthusiastic look in her eyes, when she talked about the Baltic see with its beaches like Zoppot or Kahlberg, and also Masuren or Marienburg, her hometown. One of her many stories has stayed so clear in my memory as if I just heard it yesterday. In the summer vacation my grandparents travelled with their three sons and a cousin called Waldemar to the Baltic see. Here they played in the sand, built castles and played war games. 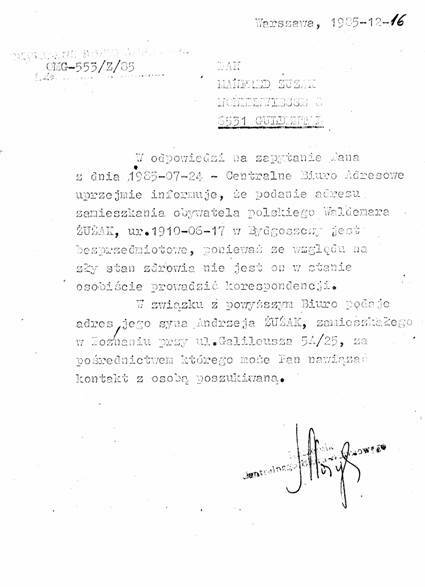 Interestingly it was Waldemar's fate, as a lieutenant of the polish army, to be taken prisoner by the youngest brother of my father, lieutenant of the Wehrmacht, 63 years ago in Graudenz. My burning questions about what happened to Waldemar and if he was still alive would be answered 40 years later. Interestingly, Waldemar dreamed before World War 2 of a Europe without hate and war. It was this Europe he fought for, said my grandmother. I would have gladly known this Waldemar. In my youthful carelessness I used to write letters to Waldemar Zuzak in Poland. But all my letters came back, since the address was unknown. But I did not give up. In the attic of my parents home 30 years ago I found in an old box with a family document in which our last name was written in different spellings. My research shows that this name has a west slavish origin from the region south Poland and the polish Ukraine. During the revolution and the industrialisation in Europe in the 19th century many people fled violence and poverty. Their they searched for a new home and found it in Germany/Prussia, Czech Republic, Slovakia, Hungary, Austria, Suisse, Slovenia, Croatia, Bosnia, and North America. Ziuziak, Zuziak and Zuzak, a change in spelling which is not quite understandable. Up until the end of the 19th century and the beginning of the twenties of the 20th century all slavish names were simplified by the public authorities. But the meaning of the name remained unchanged. This change of spelling happened to our name in the same chronology as written above. 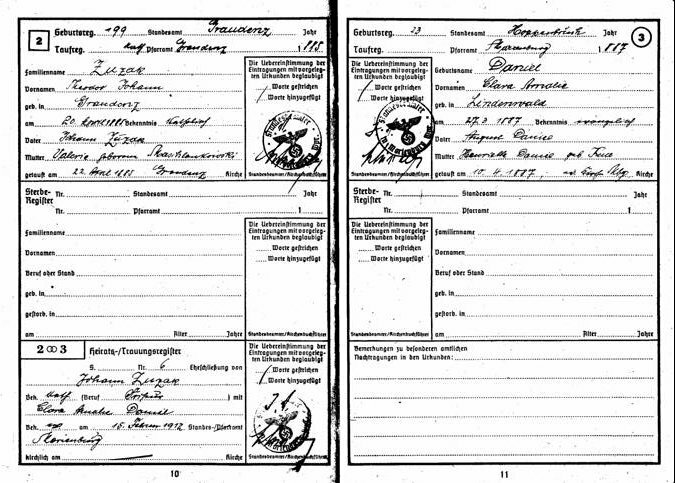 This spelling: Zuzak came into being to our family line 1912 as my great-grandfather took on the German citizenship. In the beginning of my research I depended on the few documents I found in the attic of my parents home. Besides the already mentioned family document I found a baptismal certificate of my great grandfather and also an incomplete family tree, whose author I have yet to find. With these two documents began my research with the history of the Pommerians, Kaschubians and Prussians and the states of Germany and Poland. At this point I do not want to go into historical details since these can be discovered in history books. The social environment of my ancestors was of great importance to me. Who were their neighbours? A map from this time (Photo 7) helped me to get an impression. 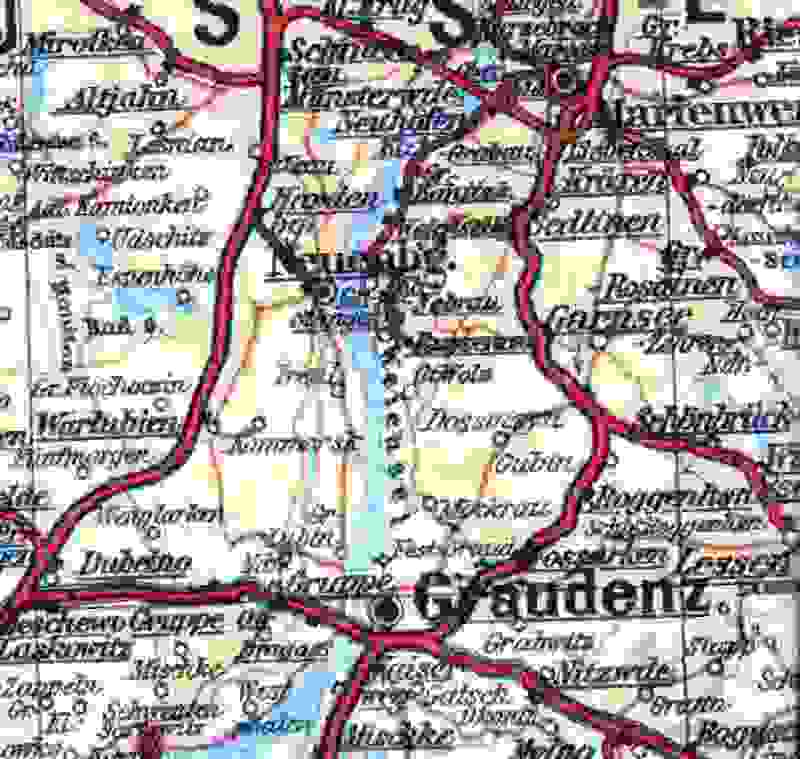 Groß Kommorsk is located NNW of the city Graudenz/Weichsel and 5 kilometres east of Warlurbien. To that time the population was seventy percent Germans and thirty percent Polish. They lived peacefully together. Great great grandfather (Photo 6) belonged to the rural population. He was a minor landlord, "Käthner". He possessed a small piece of land with a small house or "Kate". 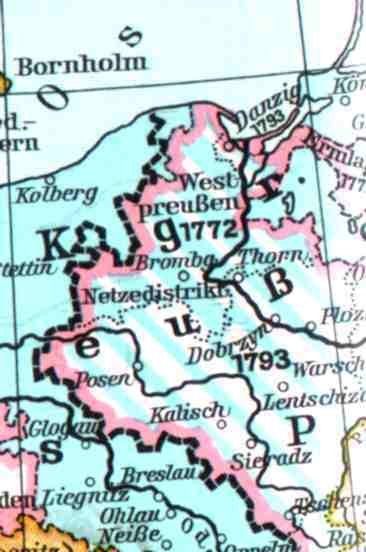 Normally the land in this area belonged to a duke from Brandenburg or Pommern. Through bravery in war, performing special services for the duke or other clever handling it was possible to gain a little piece of land. It was the possible to use the profit gained by this land to buy other pieces of land until one had their own house, horse and farming machinery. In the course of time those farmers came to wealth and improved their quality of life. Merchants and craftsman lived in cities. They possessed their own shops where they practiced their trade. 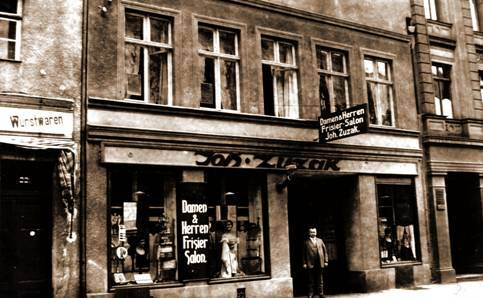 Great-grandfather lived in Graudenz and possessed his own tailor shop. According to my grandmother and father he made uniforms for both the German and the Polish army. At the end of the seventies I found another box at the attic of my parents home with important documents (see attachment). 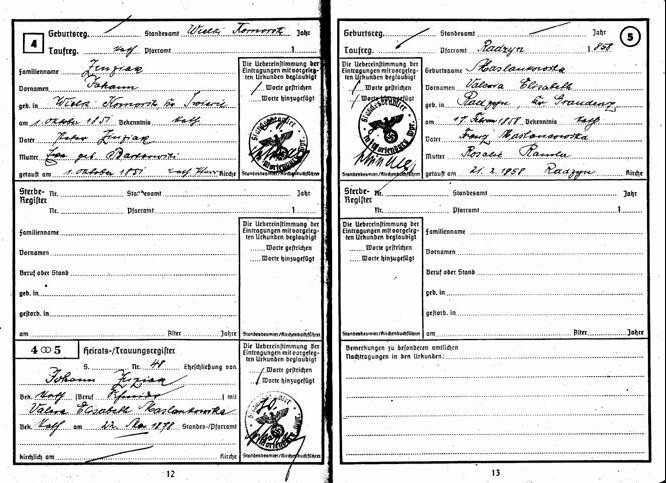 Finding these documents encouraged me to contact the parish in Groß Kommorsk in order to obtain more information about my great-great-grandfather and his parents from the church records. Due to the political situation between east and west at that time I received no answer. The "Genealogische Verein für Familienforschung in Westpreußen" wrote me that they possessed no information about the family Zuzak and also knew of no contacts or other archives that would help my search. Unfortunately that letter was lost due to a move. In the middle of the eighties my research for Waldemar made a turn for the good. A good friend who recently fled Poland for Germany and was trying to get asylum counselled me to contact the Polish embassy. In July of 1985 with little hope I asked them to help me in the search of Waldemar. Almost half a year passed by without hearing form them. Surprisingly within the time between Christmas and New Year I received a bill for 30,- DM with no other commentary. I have to say I was I was very surprised and I paid the bill with some hesitation. In the second week of January 1986 I received a letter from Warsaw. Although I only knew a bit of Polish I was able to translate it. Waldemar was found! But unfortunately through a ten-year sickness he could not communicate with me. Fortunately his son Andrzej was interested in contacting me. After a long preparation - passports, visas, customs regulations, etc. - we travelled over eastern to Poland. Together with Andrzej we began the search for our common forefathers. Our common goal was the parish of Wielki Komorsk where we hoped to get information from the church records. Perhaps we should have contacted the parish before head since our visit was a surprise for the priest. He gave us half an hour of his time and after we gave him a donation of 50 DM he promised to send us extracts from the church records. But we did not hear from him in the following 16 years. After this short visit we stayed a bit in the Kommorsk church where our ancestors were baptised and had their communion. Following this visit we went to the oldest part of the graveyard looking for traces of the past. An old inhabitant of Wielki Komorsk who we met there could not give us any information but advised us to talk to an old woman who lived on the outskirts of the town. We travelled in the direction of Graudenz and then we turned into the last street of the right. After 200 meters we came upon a small house where an old woman lived. In the course of our talk we found out that she was already 96 years old and she could still remember the last Ziuziak, Zuziak or Zuzak. Though she could not remember his first name she could describe the way to the house where he once lived. 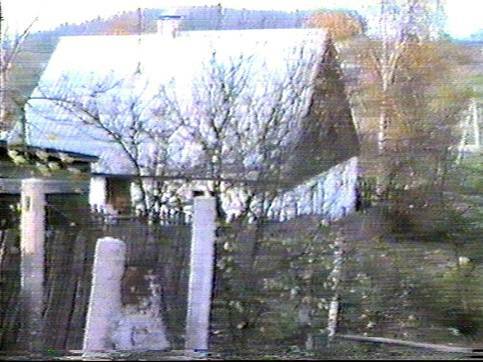 She told us also that this house (Photo 12 +13) burned down in the 1950s but was rebuilt in exactly the same way. There we stood in front of the house no. 31 which once possibly belonged to Piotr Ziuziak (Peter Zuzak). We would have liked to see inside but unfortunately the owners were not at home. 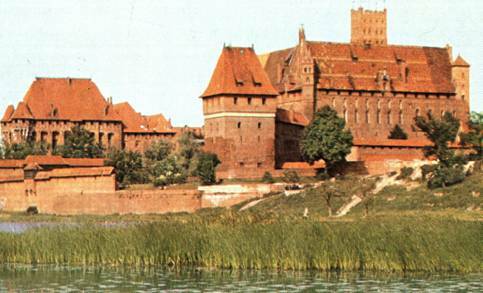 Our travels took us then further to Marienburg, where once my grandparents and their sons lived. As we crossed the Nogat we saw this giant castle (Photo 13). Once we arrived in the city we tried to find the possible location of my father's parent's house. We were very clever in doing this. We covered an old city map with a new map with the same size. In this way we found the street where the house once stood. After this depressing impression we left Marienburg and drove to the northeast. We drove through a landscape that seemed to have been left untouched for the last 60 years, untouched nature, a paradise on earth. In the villages on every 5th house storks brooded, clear lakes to the left and the right of the street. Out goal was Heilsberg (Litzbark Wrminski). Here an old wish of mine would come true. Here I would meet Waldemar. Finally after three hours of driving we stood in front of a row house. On the door I could read clearly the name Zuzak. We rang the bell. 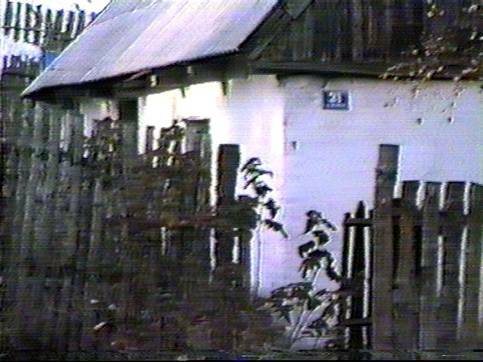 Andrzej's mother, ant Irena, opened the door. Their welcome was very warm. The moment I saw uncle Waldemar was very touching. For ten years he lay in bed and was taken care of by his wife. He was not always in such good health as he was during the three days of our visit. So as not to tire him too much we spoke mornings and afternoons just for ten minutes. We spoke about my family and what happened to them after WW2. He told me of the time before WW2 and about his political views which were influenced by his job as a judge and his social environment. Uncle Waldemar told me: "would have liked to see a united Europe which I had always fought for. Boy, if you have the possibility then continue what I have started in the west." Waldemar did not experienced the fall of communism. He died on March, 22, 1989. Since the end of the seventies I had occasional contact to Wlademar's sister, Charlotte, who lived in Sonderhausen in the former German Democratic Republic. She did not tell me anything about her family past and she also broke off the contact to me. Ant Charlotte died on July 14th 1986 and Andrzej was responsible for organizing her possessing after her death. In her personal things Andrzej found a small note that would bring a little light on the subject of our family past. However it was not the right time to find sources about our family history in the east and west. No matter what I did, all my efforts came to not. It took 14 more years before I began the search through the jungle of my past again. I have to admit that a coincidence helped me in my search. A telephone and address register of Germany on a CD was very helpful. As I looked through the names I not only found Zuzak but also Zuziak. Exited as I was I directly called all of these Zuziaks. However no one answered the phone. 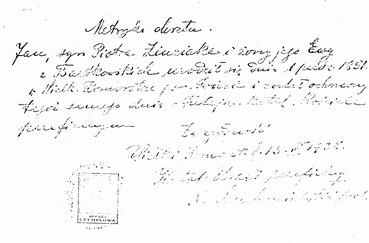 I then wrote a letter to all of them with the information that our family originally came from Groß Kommorsk. 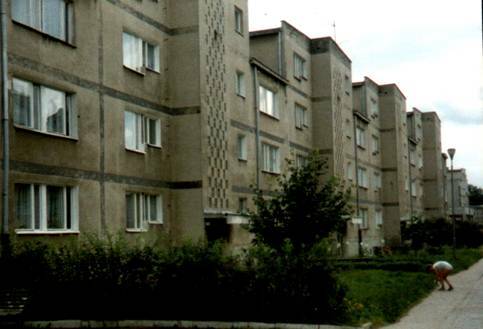 Three weeks later I got a telephone call from two of them who explained that they came from the region of Krakau. And another of these Zuziaks wrote me a letter in which he shared with me that his grandfather also came from Groß Kommorsk. This was a big surprise for me. We changed documents and also photos. However I could not find any similarities to my family. And since our name is more common then I had originally expected we decided that this was a different branch of the Zuziak family. Despite that we still exchanged copies of birth certificates and marriage documents of our forefathers. We found no connections. 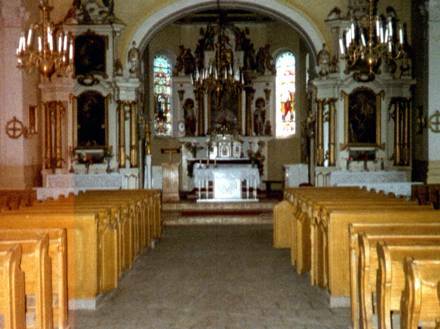 In the following year Karol Zuziak travelled to Poland and to the parish in Groß Kommorsk to look through the church records. Besides the information we already had he found nothing new, not even mention of his grandfather. Michael. However Karol did find some interesting news that we had not found out 15 years ago. 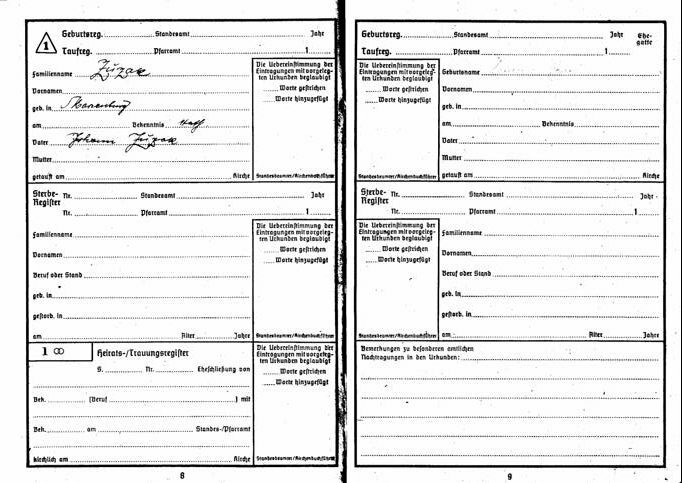 After WW1 some church records were transferred to the "Bischöfliche Zentralarchiv" in Regensburg. In the beginning of August 2001 I wrote a letter to Wielki Komorsk and Regensburg. I wanted to know what documents about Ziuziak, Zuziak and Zuzak still existed. In December I received a letter from the parish of Komorsk that included all the first names and birth dates of the children from Kasimir. In July 2002 I received the long hoped for letter from Regensburg with the names of the children of Peter Zuzak. To my surprise there was a Michael (Michal) included who turned out to be the grand father of Karol. In November I received another letter form Regensburg in which the information was not so interesting, but I included these information in the database and family tree, which you can see in the appendix. In the summer of 2002 Karol made another visit to Komorsk. He had more luck than we did 16 years before as he met the inhabitants of house 31. Karol asked for the land register number of this house since he wanted to know if it really once belonged to Peter Zuzak. With this information he travelled to Schwetz to the land register bureau. Here he found the evidence. House number 31 had indeed belonged to his great-grandfather (and my great-great-grandfather) Peter Zuzak. His oldest son Michal inherited the house and sold it to family Werner in 1928. But they never paid a single "Zlotti" for it. How this house came to the present inhabitants could not be cleared. The last owner named in the land register was Michal Zuziak. 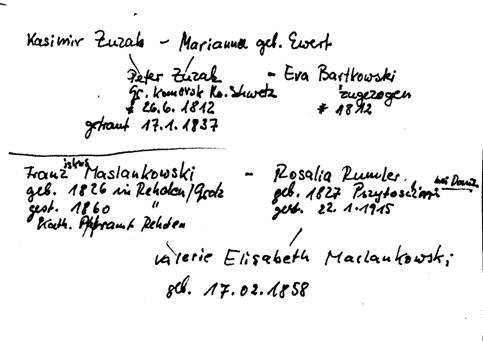 That is as far as I have gotten with genealogical research of the family Ziuziak, Zuziak and Zuzak. All the archives and possibilities for more research have been used up. If we will ever learn anything about Kasimir Zuzak, born ~1755, we must leave to fate. Mentionable is Andrzej Zuziak, Photo 20, who served as a priest for the descendants of the Polish exile government during WW2 in Manchester, England. Through contact with him I learned that his great-grandfather immigrated to America in the beginning of the 19th century. 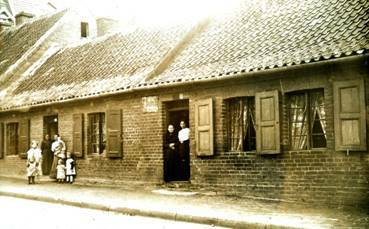 His son returned to Poland after WW1 and settled near Krakau where his family originally came from. Unfortunately he could not help me further with my research. However I was amazed to see a great likeness between him and my grandfather, Photo 19 which made me think that we might after all be related. At this point I would like to thank everyone who helped me throw a little light on the subject of our family past.